Disclaimer: The following is written from the perspective of a freelancer who needs to educate a client, but is similarly applicable to a project manager or producer who needs to educate a freelancer. Don’t value the type of vendor you’re hiring for the work. I am not interested in this project because your introductory email has shown me everything I need to know. You might think I’m fussy for saying anything. There is an opportunity for us to be better and the following conversation is one that media/tech/service industries need to have internally, and with their vendors. What is the client’s name? What are the names of your team members? What are their roles on the project? If you don’t have answers to these questions, it is too early to look for a vendor. This is valuable information for freelancers to determine how well you’ve prepared, what skills and resources are available, and if they actually want to work with your team (or with the client). Why? Working on a tight timeline, on a project that’s as exciting as oatmeal, can still be a great experience if the freelancer admires the team and can learn from them. If they’re the only one working on it, or you refuse to share this information, it seems like you’re auctioning a terrible project to get rid of it. If that is the case you should be prepared to pay a senior rate to have someone clean up your mess. Do you have client-approved documentation and branding that the freelancer can review? Do you have a script/copy/brief prepared? Do you have pre-existing creative or art direction? Do you have any relevant references that could inform the direction? These materials provide important context for someone to understand what they’re working on. It helps them to quickly onboard themselves without asking you redundant questions about the subject matter. An experienced freelancer will dive deeply into this material and respond with very specific questions. Depending on the questions they ask, you’ll have a good sense of their ability to deliver on the project. If you use this first email to ask basic questions you waste time reading basic responses. In this regard, being more specific helps you select a freelancer who is a better fit because it opens an objective conversation about the work. A tight timeline is the wrong place if what you really want is to hire someone junior and mark up their rate. What looks worse than a terrible project? A terrible project delivered behind schedule for want of an inconsequential profit margin. Is the project starting immediately? What are the key milestones for review and delivery? How long will it take you and the external stakeholders to review the work? Is the freelancer required to work on-site? If so, are you providing equipment? Or are they required to bring their own? If you don’t know what is going on with your project timelines or acceptance criteria, or you do not think it’s important to share that information, why would anyone trust you to act on their behalf? Where are your customers? Do we need to find them? Is the media going to be presented in print, on a mobile device, on a website, on broadcast tv, on a kiosk, on a theatre screen, or projected onto a building? Is it all of these things, or just a few? For instance, does any website data need to be hosted on a regional server? Are there any specific (legacy) browser requirements? Is the freelance vendor required to submit the work for broadcast trafficking via Extreme Reach (or similar)? Which networks will it be shown on? What are the resolution and frame-rate requirements? (4k, 1080p high definition-only? Will it be centre-cut to standard definition?) Do you require the source-files to be archived and delivered upon completion? These are important details for defining where the media is shown and can cause complications with each day they are left undefined. Do you have a budget expectation? Will this work require the freelancer to hire a third-party implementer (trafficking, installation, delivery, etc.) to complete the work? Are you going to pay a project deposit on work to be completed? Are you going to pay invoices within 14 days of receipt? Do you have a sample contract or statement of work? Are you licensing the work or proposing a “work-for-hire” agreement? You should know how much it costs. Freelancers know how much it costs. Not giving an indication of how much you want to spend is a waste of everybody’s time. For whatever reason, you need this work done, and freelancers can do it for you if it’s defined as a fair exchange of labour. When you leave budget out it seems like you’re hiding something or trying to nickel-and-dime… and wait, are you seriously trying to negotiate a lower rate on a project that needs to be done tomorrow? Someone who can pull this off without sweating will charge you $75–150/hr. You know that. You also know that the industry expectation for this work is $50/hr, minimum. Oh, and also, last minute projects should be paid hourly with the expectation of 1.5x(rate) for overtime in excess of 8-hr days. And believe freelancers, they’ve done this before, you are not the first person to ask it of them, it will require overtime. Time is a project constraint because you, the end client, or someone on your team has made it one. That’s only an ongoing problem if you continue to ignore it, but know that it is not the freelancers responsibility to take a pay cut because you waited too long to send an email. Thank you for your time, please let me know if you have any questions. You don’t need to include all of these things, but the more you include, the easier it is for a freelancer to determine if there is a good fit. “I don’t know?” is an applicable answer to all of these questions, but realize that there is a variance of time when these questions still need to be answered. A note for project managers and producers: Provide more detail than you currently do, respect your team and freelancers so that you never receive this email. There will always be project details that you are contractually unable to share. Do your best to set up a project on the best possible terms. The person you’re hoping to work with has no reason to trust that you’ve considered their best interests. They’ve likely been burned by someone else’s carelessness. They’ve likely been haggled with on terms that are assumed to be “industry standards”. You need to show them through action and consideration that this project will be different. It’s risky for both parties. It’s better for our collective-tangential-related-unrelated industries and it helps you find people who do good work. It also helps you find a network of people who actually want to work with you. A note for freelancers: You’re living in the wild west. Everyone wants more for less and it’s getting worse by the day. In contrast to what you’re feeling, the people hiring you may have no idea if you’re able to deliver the project. This project manager or producer has likely been burned by a freelancer before; they didn’t show up, they didn’t deliver, they lied about their qualifications. It’s risky for both parties. The industry gets better when people work together and agree on mutually-beneficial terms. It changes from project-to-project and that is completely normal. If you don’t know how much time something takes, what you should charge, how to write a contract, or how to track your time… Figure it out. If you want project managers and producers to respect you, respect them in return. 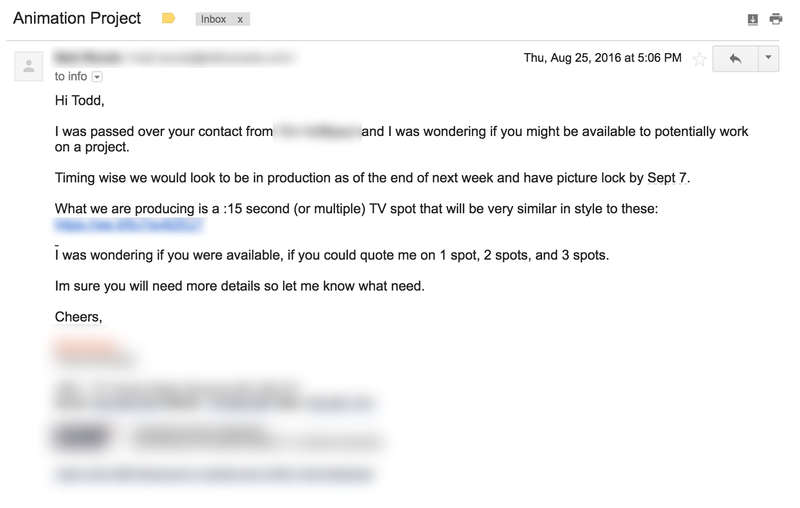 Don’t send this email as-is; snip, cut, adjust however you see fit, but know that it intentionally includes a level of snark that should never be sent to people you actually intend on working with. If you’re a PM, Producer, freelancer, etc., have read this far, and found it helpful, please tweet a picture of a dinosaur to @toddsmithdesign to show your appreciation.